In exercise of the power conferred by the explanation to Section 25 of the Negotiable Instrument Act, 1881 (XXVI of 1881), read with Government of India, Ministry of Home Affairs, Notification No. 20/25/56-pub(1) dated the 8th June, 1957 the Governor is pleased to declare the following days to be Public Holidays during the year 2018. 2) The holiday with double asterisk marks i.e. (**) is applicable to those Government Offices only where Saturdays are not observed as full holiday. 3) General Instructions as laid down below in this Notification 6005-F(P2), dated 22.09.17 are to be followed in case of Muslim festivals. 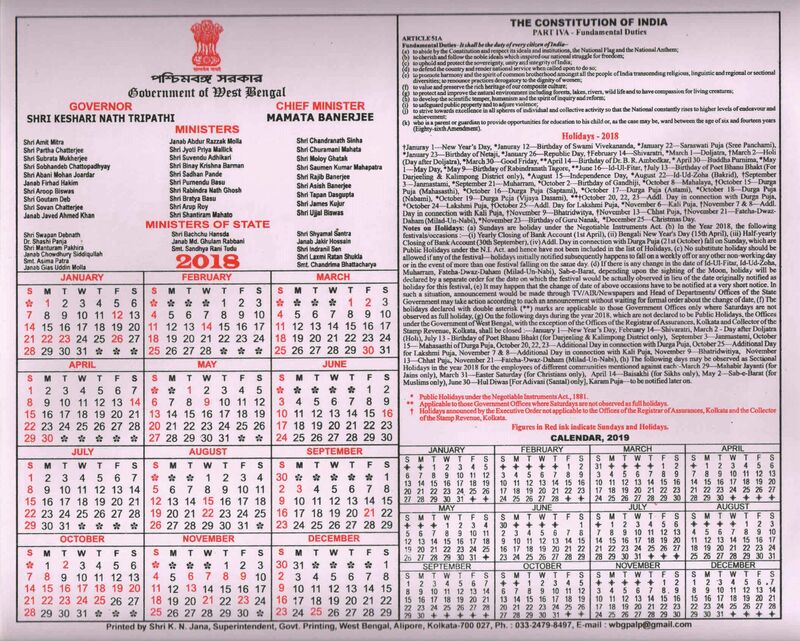 The Governor is pleased to notify that on the following days during the year 2018, which are not declared to be Public Holidays, the Offices under the Government of West Bengal with the exception of the Offices of the Registrar of Assurances, Kolkata and Collector of the Stamp Revenue, Kolkata shall be closed. 1) In the year 2018, the holidays with double asterisk marks i.e. (**) is applicable to those Government Offices only where Saturdays are not observed as full holiday. 1) No substitute holiday shall be allowed if any of the festival – holidays initially notified subsequently happens to fall on a weekly off or any other non-working day or in the event of more than one festival falling on the same day. 2) If there is any change in the date of Id-Ul-Fitre, Id-Ud-Zoha, Muharram, Fateha-Duaz-Daham, Sab-e-Barat depending upon the sighting of the moon, holiday will be declared by a separate order for the date on which the festival would be actually observed in lieu of the date originally notified as holiday for this festival. 3) It may happen that the change of date of above occasions has to be notified at a very short notice. In such a situation, announcement would be made through T.V./ A.I.R./ News Papers and Heads of Department / Offices of the state Government may take action according to such announcements without waiting for formal order about the change of date.